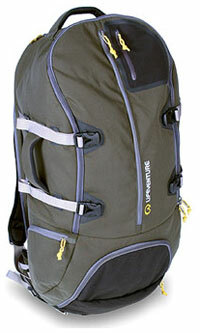 Lifeventure says:"A classic travel rucksack. The understated design of the Altai hides a myriad of unique and useful features - each of which has been added with the potential wear and tear of world travel in mind as well as your comfort. This pack is reliable as well as clever! It also has an 15 Litre pack-away daysack which is ideal as a day bag or simply for that little bit of extra storage when you need it"
Manufactured from 75% recycled materials. The adjustable back system together with the load management features via internal pockets and compressions straps meant it was easy to be comfortable when carrying the pack irrespective of loading. Access to the interior is easy via either a long front zip or via the zipped base. There really are a great array of pockets and compartments to help in organising your gear. (I was particularly pleased with how easy it was to separate the clean from the not so clean!). The packable 15 litre daypack was a useful little addition for when the main pack was stowed. Whilst this rucsac is probably not best suited for a dedicated trekking expedition, the Altai does have an impressive array of travel oriented features so if you're looking for a combination hold-all/backpack then this is a really good option particularly if a manufacturer's environmental credentials are important for you.